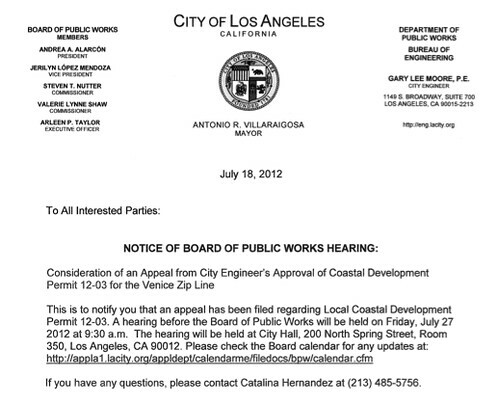 Venice Zipline Appeal Hearing: August 10 - Yo! Venice! Update: New hearing date is Friday, August 10, at 9:30 a.m.
An appeal has been filed in regard to the City Engineer’s approval of the coastal development permit 12-03 for the Venice Zipline. The hearing of the appeal will be held before the Board of Public Works on Friday, July 27th at 9:30 am at City Hall in room 350.